Imagine walking into your home and smelling the sweet scent of fresh baked bread at the beginning of the evening. Imagine always having a soft, sumptuous loaf of Italian bread with your pasta or a light and airy French bread with your roasted pork. Without living next to a bakery and spending a fortune, you can bring that wonderful experience into your home with the simple addition of a bread machine. 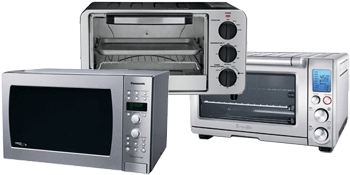 Bread machines, also known as bread ovens, are perfectly crafted to make break baking one of the easiest tasks you have ever performed in your kitchen. I know that this will probably come as a surprise to those of you who thought baking bread was difficult. If I’m honest, baking bread can be difficult, but only if you do it the traditional way. By using one of the cutting edge, modern machines, however, baking fresh bread for every major meal is actually as simple as making just about anything else. I’m so impressed with this bread maker that I really don’t even know where to begin. If you’re looking for something with all the bells and whistles – one that will bring you incredible quality and you don’t mind spending a little extra cash to get it – I think you will be very happy with this choice. I won’t lie to you here, this bread maker may be outside the price range a lot of you expected for a bread machine. However, more options and functions require more advanced technology which, typically, costs more money. If you are a serious baker with little to no time to prepare you bread, however, this investment is definitely worth it. Actually, I think this machine is worth it even if you aren’t a serious baker; even if you have never baked in your life. This machine is so advanced that it takes all of the guesswork and difficulty out of the baking process. You won’t have to do any of those traditional time consuming tasks which were once required to make bread. You simply need to know which breads have the flavor you like. Then you find all your ingredients, follow the instructions, select your bread type, and you are on your way. The machine is specially designed to know that different breads need to be baked at different temperatures and treated in different ways. It does all this work for you. It will adjust the temperature however necessary to ensure your dough comes out just as you expect it. Before you even begin baking, it will even mix the dough to the perfect consistency for you! Of course, if you have special requirements or just like things a specific way, you can alter some of those pre-programmed settings by changing things like how crusty the crust will be. 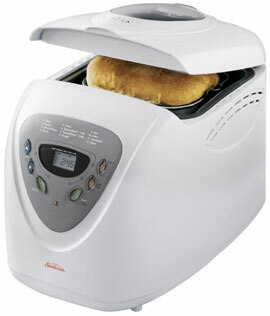 The range of possibilities with this bread maker are endless. You can select among many different kinds of bread, including filled breads and gluten-free options! I talked a lot about that last machine. Let me tell you something though, I still didn’t even manage to tell you everything about it. I fear the same will happen here. Though this machine has fallen into second place, it is almost as remarkable as the one listed above. It’s hard to expect any less, though, from the Zojirushi company. One major difference between this model and the one listed above is price. This one is more affordable, bringing it further into the realm of possibility for many of us budget-bound folks. 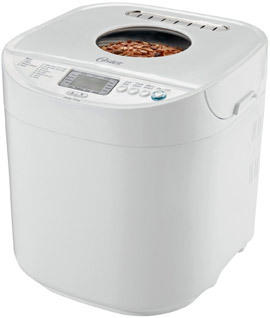 If you find yourself dealing with a budget which has a little wiggle room and you are in search of a bread maker which will do it all for you, this one should definitely be considered. Like the bread oven listed above, this one will do all the major work for you. It will mix the dough and bake it to your exact specifications. Though it doesn’t have quite as many bread type options as the one listed above, it does share certain other characteristics. Some of those characteristics are ones which I did not have enough space to discuss in the first machine’s description. Therefore, you can just go ahead and consider that everything I say in the rest of this review also applies to the previous machine as well. A delay timer allows you to put all the ingredients for your dough into the machine up to 13 hours in advance. This is perfect for people who want to prepare things before bed or work and either wake up or return home to fresh, warm bread. It also includes a quick-bake option which will allow you to fully prepare a warm, fresh load of bread in as little as two hours! Anyone who has baked bread the traditional way knows that this is almost akin to a miracle. I have to say, this is the most stylish bread maker I have ever laid my eyes on. Of course, everyone has their own opinions and you may not agree, but the sleek, squared, stainless steel exterior of this unit is far more appealing to me than the rounded plastic exteriors of many of the other options on the market. Though I would never recommend purchasing any type of appliance (large or small) on the basis of its appearance, I would come pretty close to suggesting you do just that for this one – especially if you have a 1950s-inspired kitchen. OK, let’s move this thing along, here. I’m certain that you are interested in a lot more than simply the appearance of this machine. What you want to know is how well it works. Well, the fact that it is third in this list should tell you that it isn’t very likely to disappoint. In fact, you are likely to be very impressed by the range of bread types this baby can create. You can create many different types of bread, other doughs, and sweet cakes in this unit. You can even infuse jam into your food! Want to make only jam? Sure, you can do that here! There are over 100 possibilities when it comes to this machine, including the ability to alter your crust type and select among 3 different loaf sizes. Additional features include a beep notification when the bread is finished cooking, and various programmable settings. You can delay the timer up to 12 hours so that you can set it and forget it and still return home to warm bread. A power-failure backup system will restore your settings and continue baking your bread if a power failure occurs and is resolved while you are away from the machine. 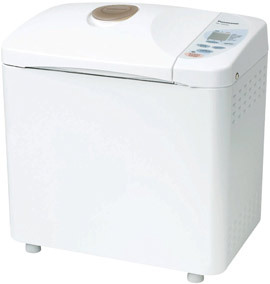 If you are looking for incredible quality without a ridiculous price, you should turn your attention to this bread maker. 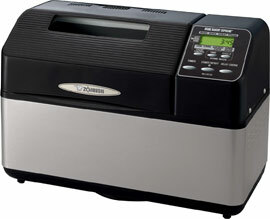 In fact, you can even save extra over the already impressive price of the CBK-100 if you turn your attention to the world of refurbished bread machines, because this one comes at reduced prices if you order a refurbished version. If you aren’t sure what refurbished means, allow me a moment to explain it to you. A refurbished machine is one which has already been used and returned. Perhaps it was returned because something was wrong with it or maybe just because the person didn’t want it, after all. If it turned out that something was wrong with it, Cuisinart (as per their policies) would have tested it thoroughly to see what was wrong. They would have replaced any faulty parts and retested it to be sure it was okay to sell. Some people shy away from refurbished machines, but the truth is that they actually go through more testing before you buy them than any other machine. They are also thoroughly cleaned before they are sent out, so you won’t have to worry about the fact that someone else used it before you did. Like the original (non-refurbished) version of this machine, this one features 12 pre-programmed cook settings which you can alter according to the type of crust you would like. You can set up to a 13-hour delay of baking on this unit as well. It also has the ability to create a one-pound, one-and-a-half pound, or two-pound loaf. Something you may have noticed in your own search for the best bread maker is that most of them are created wide. They take up considerable space on your countertop and require you to be able to reach their tops to adjust their settings. This option, on the other hand, is perfect for people with little space available in their kitchens. It is slim enough to slide between other appliances (such as a microwave and a refrigerator). Though you will have to pull it out to put the ingredients in and to remove the bread itself, you will be able to reach the buttons even if you have very low cabinets above. So, it’s slim enough to fit into your tiny, little space, but what does it do? Obviously it needs to also be a good bread maker, or I wouldn’t have placed it on this list. Twelve different pre-programmed settings allow you to select among a variety of bread types, depending on your own preferences. You can also choose among three different crust types, offering a total of about 36 different options. The non-stick interior will clean easily and will allow your bread to slide out effortlessly after completion. Slightly as slim and compact as the machine I just discussed above, this option is almost as great for small spaces. Its major selling point, however, is the size of loaf it has been made to create. Whereas all of the other options I’ve listed on this page are capable of making a two-pound loaf (or more), this one stands out with its maximum capacity of one 1-pound loaf. This is built for those people who know that they will never have any use for a 2-pound loaf. While some of the others here give you the option of selecting a one-pound loaf, they are all built to accommodate a two-pound loaf as well. Small size does not, however, mean small ability. Though this is made only for a one-pound loaf, it still boasts the ability to create a variety of different kinds of bread. 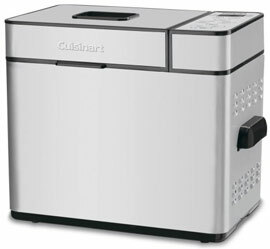 Since it has a built-in mixer (like most bread makers) you can also use it to mix cookie dough and pizza dough. Of course, you will not want to set it to bake afterward – you would find yourself with one giant cookie or clump of pizza crust. 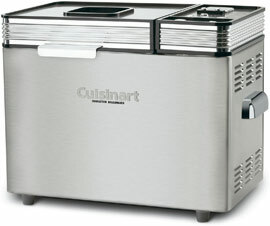 This unit can also be used to create jams or bake cakes. Talk about a ton of options in a small package! You can set the bake option to delay as much as 13 hours, and the interior is completely non-stick for your convenience. One thing I have noticed with the other bread makers listed on this page (and even those which didn’t make their way onto this page) is that they aren’t very easy to use. While I believe that using a bread maker is much easier and simpler than baking bread from scratch, many other people would beg to disagree once they get a look at the control panels on these things. For those people who aren’t very familiar with technology, running a system like this would be very difficult. There aren’t many one-button options on other machines. You often have to flip through different pre-programmed settings in the menu and select additional add-on settings before you can really get down to business. Other options make you select among different ranges of cook options which encompass multiple types of bread. There’s a reason I didn’t go ahead and dumb that process down – simply reading it is complicated; imagine actually doing it! This machine, on the other hand, is very simple and easy to use. If you want to select a specific type of bread to cook, you just push menu, then choose the number located next to the name of your desired type – it is as simple as that. Forget about jam and cookies and cakes and all that other stuff. This machine makes bread and nothing else. Why make things more complicated than necessary, right? Are you tired of those tiny little 2-pound loaves of bread? OK, I have to say it – a 2-pound loaf is not small. However, if you entertain a lot or have a large family, I can understand how it may seem small. 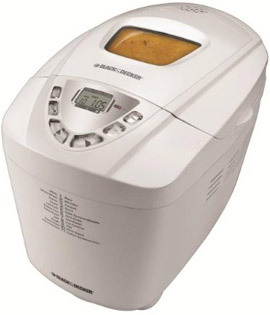 For those of you with 6 or more people in your family, for those bread lovers that just can’t get enough, and those of you who love to entertain, I introduce this Black and Decker three-pound loaf bread maker. 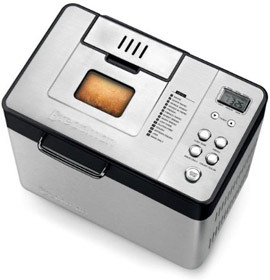 The major selling feature for this bread maker is the fact that it can create a 3 pound loaf. I don’t feel it’s fair, however, for me to simply say that and nothing else. After all, this isn’t the only three-pound bread maker on the market. I must have, therefore, chosen it for some other reasons, as well – reasons which I will share with you now. If you decide you want to create something a little smaller, you can choose to create a 2-pound or 2.5-pound loaf instead of the 3-pound one, by simply clicking your way through the different sizes on the LCD display. You can also select among three different types of crust – soft, medium, and crispy. Ten pre-programmed settings allow you select among different types of bread, from Italian to sourdough. Finally, a 13-hour timer delay allows you to set it and forget it. Ever noticed that your bread just doesn’t come out the same from a bread maker as it does when you make it in the oven? That may be because your yeast is added to the process far too early. If you put the yeast in right at the beginning, mixing together all the ingredients and just setting your bread to bake, you haven’t actually added it at the optimal time. 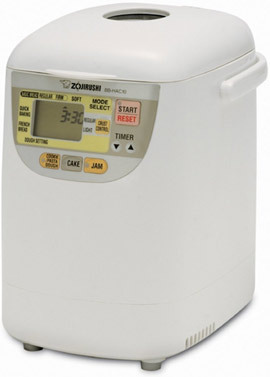 This bread maker is unlike all the others in that it has a special “yeast dispenser” which will add the yeast to the process at exactly the right time to make your dough perfectly tasty and fluffy. Other wonderful qualities of this machine include its six different bake settings. You can choose among basic bread, whole wheat, French bread, multigrain, pizza, and “bake only.” The bake only function is best when you don’t need yeast added and you don’t need the mixer blades to prepare your ingredients. This is a great setting for baking cakes. This unit comes with its own recipe book with over 40 flavorful bread recipes inside. It also allows you to choose among three different loaf sizes and three different crust finishes. 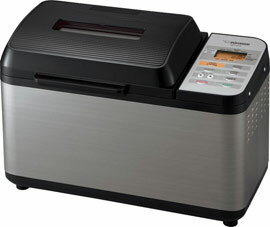 A fraction of the price of any other model on this page, this bread maker is built for those trying to maintain life within a strict budget. As someone who has spent a fair amount of time inside that budget bubble over the years (hooray for student loans), I understand the importance of finding a quality machine in my price range. This is a big part of the reason why I located this machine in the first place – I know that not everyone will be able to afford the other options on this page. I do want to throw a word of caution out there before I go ahead and describe this machine to you, though. When it comes to kitchen appliances, large or small, you often get what you pay for. This is something else I have learned throughout my years in the budget bubble. Sometimes, what looks like a deal really isn’t. In this case, I am quite pleased to stand by this particular bread maker.